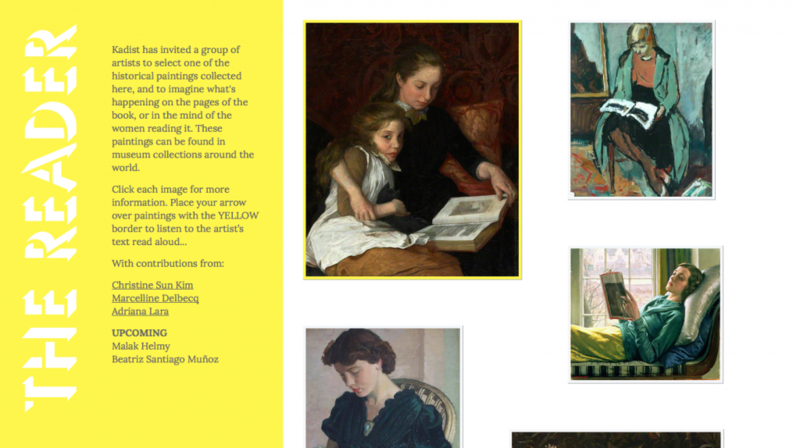 For The Reader, we’ve invited artists from around the world (New York, Cairo, Mexico City, San Juan Puerto Rico, and Paris) to write a text giving voice to an historical painting of a woman reading. Contributing artists include (in order published) Christine Sun Kim, Marcelline Delbecq, Adriana Lara, Malak Helmy, and Beatriz Santiago Muñoz. The last two artist contributions are forthcoming. The paintings collected for the project have been selected from museum collections that have published them online—making them liable to criticism and new kinds of interpretation. In researching paintings by anonymous artists and unknown subjects, we discovered an unusual recurrence of women reading books, where the text on the pages of the book is indecipherable, and the book remains unidentified. The contents of the pages of these books, abstracted in brushstrokes, suggest a world of possible narratives. This led to a series of questions like: Who are these women? Are the details of their lives and stories lost to an erosion of historical record? What was her relationship to the book? Was she hired and paid by the painter? or did he know her? Was the book a tool to help the woman sit for an extended period, or a prop suggestive of an internal mental process, or…? We started to think about the women, the book, and the painter as three characters in a possible narrative formation. So, in inviting artist/writers to engage in a provocative intermingling of fiction and museological record, we also invited them think about about a rupture in the time, as the cultural attitudes voiced in the present are overlayed on paintings from as early as the 17th century. The majority of the paintings, however, are from the 19th century, a era marked by the spread of mass literacy, and the success of the popular novel. This century is also associated with the spread of education and the shortening of the work-day. Women formed a large and growing part of the readership, thanks to expanding educational and employment opportunities for women in the mid to late 1800s. Women writers also appeared at this time. According to the Martyne Lyons, who wrote an essay titled New Readers in the Nineteenth Century: Women, Children Workers, the role of the women reader was traditionally that of a guardian of custom, tradition and family ritual. But over time, women developed more secular tastes, as a new market developed that catered to them. These included the cook book, the magazine and the cheap popular novel. Alternatively, these paintings seen through the lens of the present might be decoded by an art historian to talk about the shifting role and social status of women through the last three hundred years. A group of visual artists were selected for their work with language, typography and narrative. The first contribution to The Reader was from New York based artist Christine Sun Kim. Her narrative is accompanied by a text document that includes an unspoken series of parenthetical comments that are only readable, not audible. Sun Kim is deaf, but often makes audio artworks. She wrote a short narrative of a woman waiting for a social engagement, but beautifully emphasizing her internal, embodied experience. The second, in french, is written and read by Paris based Marcelline Delbecq. In selecting a painting where the woman is known to be the wife of the artist, Delbecq thinks about her name, Périe, which in French means “Passed away,” as a point of departure for a short reverie. The third contribution is from Mexico City based artist Adriana Lara who has selected a section of the Marquis de Sade’s Philosophy in the Bedroom, dramatically altering the viewing, or “reading” of a painting of two young girls. Paintings are shown at a scale that approximates their actual physical proportions in relation to others on the webpage, with the exception of the newest contribution, which is shown larger and at the top. The website was coded by Oliver Wise, from the Present Group, Oakland, CA. The Reader is curated by Joseph del Pesco and organized in collaboration with Enar de Dios Rodriguez.